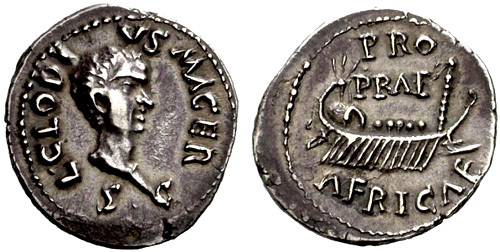 Clodius Macer, was governor of Africa at Nero's death, A.D 68, when he laid claim to the throne. He was murdered at the instigation of Galba by the procurator Trebonius Garudanus. Obverse: L CLODI MACRI LIBERATRIX, S C below; Bust of Africa right, draped, in elephant-skin head-dress; behind, two javelins. Reverse: LIB (on left), AVG (on right), LEG - III divided in low central field. Aquila right between two vexilla. Obverse: L CLODI MACRI LIBERATRIX, S C below; Bust of Africa right, draped, in elephant-skin head-dress. Reverse: MACR, I - A, NA LIB, LEG - I divided in low central field. Aquila right between two vexilla. Obverse: L CLODI MACRI, S C below; Bust of Victory right, draped, with wings spread upwards. Obverse: L CLODI MACRI, S - C in centre field, Bust of Victory right, with wings folded down. Reverse: LI-B across top, AVG, LEG- III divided in low central field. Aquila right between two vexilla. Obverse: L CLODI (on left), MACRI (on right), S-C in centre field. Figure of Libertas standing left, draped, right holding pileus, left patera. Reverse: MAC (in exergue), RIANA, LIB (on left), LEG -I divided in low central field. Aquila right between two vexilla. 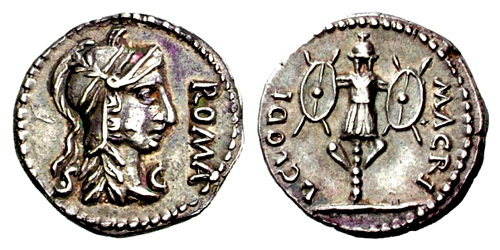 Obverse: ROMA (on right), S C below, Head of Roma right, helmeted. Reverse: L CLODI (on left), MACRI (on right), Trophy, with two pointedly oval shields, but the oval shields with more rounded ends. 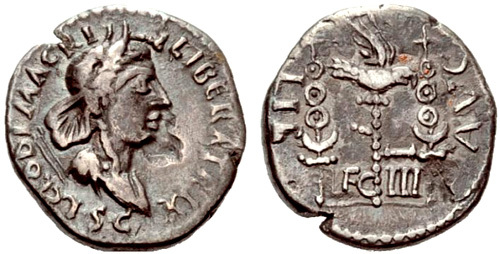 Obverse: L CLODIVS MACER, S C below, Head of Clodius Macer right, bare. 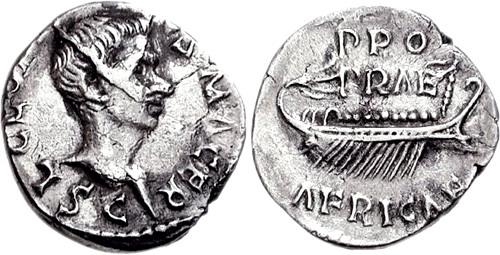 Reverse: PRO/PRAE in two lines above and AFRICAE below war-ship right, with 12 oars and 10 oarsmen (RIC 35 = 4 oarsmen). Reverse: PRO/PRAE in two lines above and AFRICAE below war-ship right, with 12 oars and 7 oarsmen. Reverse: PRO/PRAE in two lines above and AFRICAE below war-ship right, with 13 oars and 5 oarsmen. Reverse: PROPRA above and AFRICA below war-ship left, with 10 oars and 7 oarsmen.